The VVG 3D Visualisation tool is the result of a collaboration between Federation University Australia and Queensland University of Technology. The system has been designed to take advantage of new web technologies and is currently in beta testing. To ensure the 3D Scene works best for you, please check these minimum/recommended requirements. Any platform that is able to install the latest compatible browsers (as noted below) should work. Windows XP is unable to install above Internet Explorer 8 and therefore is not compatible. Chrome, Firefox, Safari (latest versions), Internet Explorer 10 or above. Other browsers may work, however they have not been tested for compatibility. If your browser does not meet the minimum requirements a message will come up on your screen with the relevant information. Widescreen monitor size of 20" and above recommended for best viewing. Note: Government departments and some other organisations have this port blocked. We are working on a solution for the near future. Access to 3D Scene is via the VVG portal. The option will be greyed out until you are zoomed in to a minimum of 1:108K (as shown in bottom left corner of portal). Zoom into the area you would like to see in 3D and click on '3D Scene' which is located in the top right corner of the map under the Google layers (Figure 1). You will be redirected to the 3D Scene webpage in a new tab or window. For more viewing options go to Viewing tools. Toggle Perspective - Click on this to change the perspective (two options). Toggle axis - Click on this to remove the box around the 3D Scene and its depth and coordinate markers (Eastings and Northings). Reset View - click to go back to the original view that first loaded, including removing any slice you have made. Slice front and back view - When you use the slice tool, this give you a section view from the front (where the slice was taken) or the back (the edge). This axis can be moved by clicking the mouse over it and dragging to move it to your position. Turn the slice mode on by clicking which covers the icon with a green square when on. A red rectangle will also appear in the 3D scene (Figure 5). The red rectangle is where the slice cuts through (Figure 6) and clicking on that will slide the slice tool backwards and forwards. The long pipe with cones on the end and a sphere in the middle is used to change the angle of the slice. It is recommended to cut the slice straight away so you can make full use of the toggle slice (you can re-cut the slice multiple times). Alternatively rotate the 3D scene to a side view to see the red pointer with cones at each end as shown in Figure 6. After slicing there will be a line with a cone at both ends (the layers may be covering the other end as in fig x) and a sphere in the middle. To slide the slice tool along the 3D area, click the red edged rectangle and drag to the desired position. To change the angle of the slice, click one of the two red cones or the line between them and hold mouse down to move to the angle you would like. This spins around 360º (Figure 6). Keep in mind, the surface layers will disappear on the side that has the cone pointing outwards. The bore group layer will remain on the layers that have been cut away if ticked. To learn how to remove bores from view go here. Click again. You can re-cut the slice many times over. To reset the slicer to the original angle and position and undo any cut that has been made click on . The vertical exaggeration tool (Figure 7) increases the vertical scale to allow you to see vertical features more clearly in the landscape. The default is set to 15x (vertical scale 15 times greater than the horizontal scale) and by clicking on the scale slider you can vary it between 1x and 100x. This is a sliding scale that shows the quality of the image whilst you are interacting with the scene, for example moving to a different view angle with the mouse button pressed down. The higher the percentage you have this set to the better the quality whilst moving your picture, however this will significantly slow down your ability to navigate smoothly. 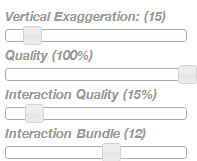 Once you have released the mouse button, the image quality will load to the percentage you have in 'Quality'. The bores shown at this stage include only the WMIS bores. Double mouse click a bore at the site marker (pentagonal cone) and the marker will have a light grey cover shown over it, the bore ID will be shown and if depth information is available it will be shown as per Figure 9. The red pipeline will change to a dashed line. 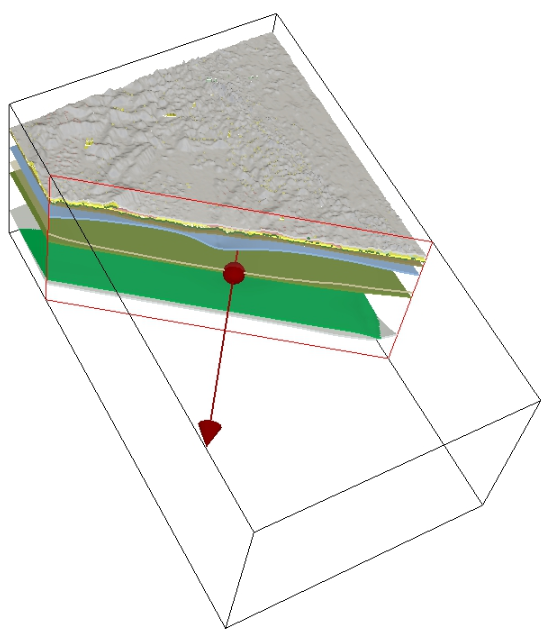 The bores are shown in the 3D Scene as red pentagonal cones above the surface connected to cylinders below the surface (to denote depth where available). These can be manipulated to have aspects shown or not shown. The bore radius can be changed and information about the bores can be shown. 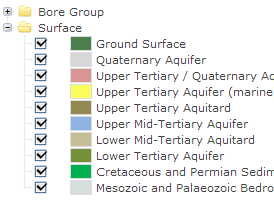 To show the options for changing the bores, click on the next to 'Bore Group' in the top right hand corner. This will show the WMIS bores. To remove the bores from the 3D scene, untick the box next to WMIS Bores. 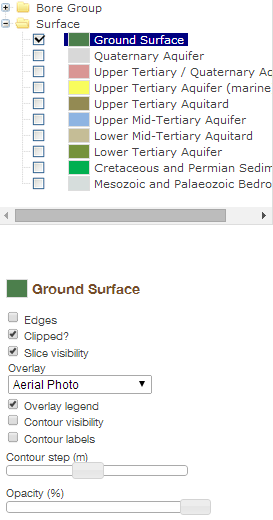 To remove the other layers so you can only see the bores, click on the for 'Surface' and untick the aquifer layers. To modify the appearance in other ways, click on WMIS Bores to show the options for viewing. Figure 10 shows the default settings when the scene is loaded. Site marker - can be unticked to remove the pentagonal cones. Labels - can be ticked to show the Bore ID. Depth logs - shows pentagonal cylinders underneath the site markers (for bores where logs are avaible), alternating between tan and brown showing a change in lithology. 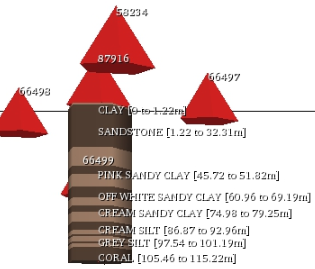 Depth log details - shows either the driller (D) or geologist (G) log depending on what is chosen under the drop down box (where they are available) as shown in Figure 11. You may need to untick the aquifer layers to see the log more clearly. 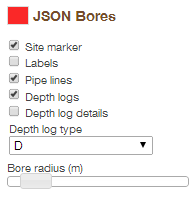 Depth log type - A drop down box for either a driller (D) or geologist (G) log. Not all bores have this information. Some have both. Bore radius - a sliding scale to change the size of the bore shown on the map (for easier viewing). 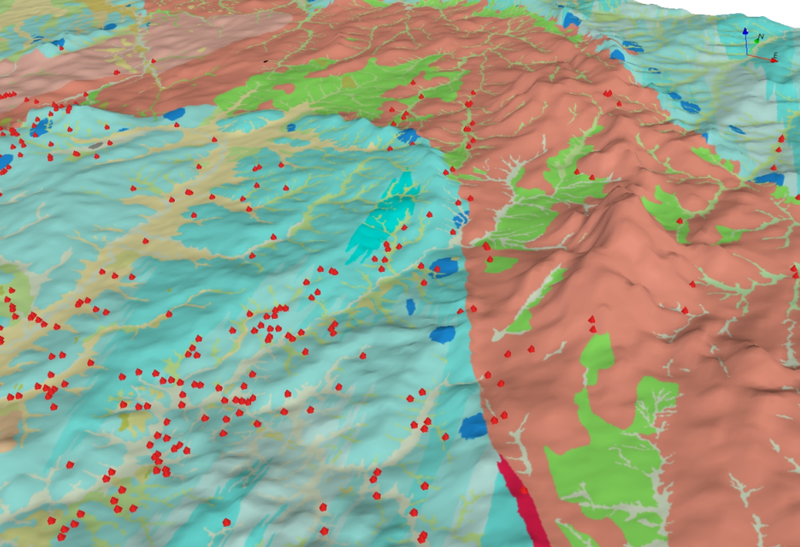 Range is from 1 to 1000 m.
The surface and aquifer layers are found by clicking the next to the 'Surface' folder in the top left hand corner of the 3D scene page (Figure 12). To remove a layer from view, click the ticked box next to the desired layer and it will untick . To change other settings with the layers, click on the name of the layer you wish to change and a set of options will come up below (Figure 13). Clipped - untick this box to show the whole layer even when a slice is cut. Slice visibility - this will show the layer edge at the sliced location even when the layer is hidden. Overlay - This is a drop down box that shows either 'Solid colour' or 'Elevation map' for the aquifer layers and also includes 'Aerial (Landsat7)', 'Aerial Photo' and '50k geology' for the Ground surface. Overlay legend - This displays a legend for the selected overlay if there is one (Elevation map?). 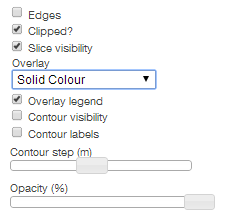 Contour visibility - Tick this box to show contour lines for the layer (Figure 14). 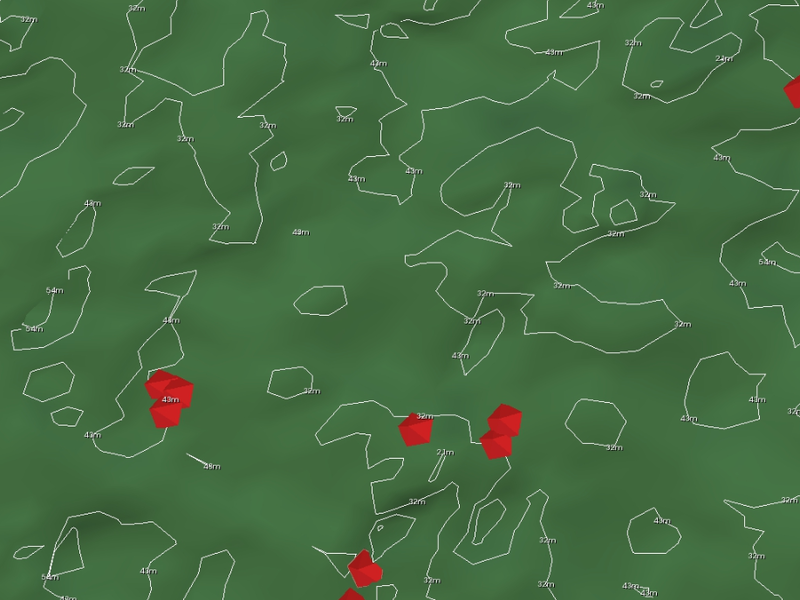 Contour labels - Tick this box to show the height of the contours in metres. The 'Contour visibility' box must also be ticked for this to be visible. Contour step (m) - This is a sliding scale to change the increments in which the contour lines will be shown, varying from 1 - 100m. Again, the 'Contour visibility' box must be ticked to view the steps. Opacity (%) - This changes the ability to 'see through' the layers. The default is 100% which is a solid layer, you can go down to 0%, where the layer would not be visible anymore. Example shown in Figure 15, with the surface shown at 42% opacity. You can see the pipelines for the bores. Click on next to the 'Surface' folder in the top left hand corner of the 3D scene view. This will drop down the aquifer and surface layers. Click on the 'Ground surface' layer to bring up the options below. Click on the 'Overlay' drop down box and select 'Aerial photo'. If the aerial photo looks patchy, it is due to the aquifer layers shown higher. Hide these, or decrease their opacity. This will show the aquifer and surface layers. Click on the 'Ground surface' layer to bring up the options (Figure 18). Click on the 'Overlay' drop down box and select 'Victoria Geology 50K/'. This will drape the geology over the surface as seen in Figure 19. If the geology looks patchy, it is due to the aquifer layers shown higher. Untick these, or increase their opacity.